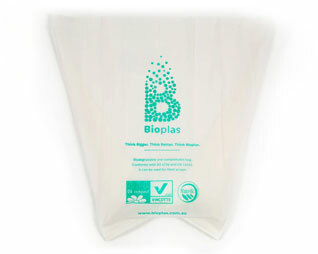 Bioplas biodegradable and compostable carrier bags are available in a variety of size and design. Customised environmental bags assist retailers to promote their push towards sustainability. All carrier bags can be re-used for kitchen waste collection. Biodegradable and compostable food packaging is available with different mechanical properties and transparency grades. Bioplas provides an excellent sealing layer for co-extrusion films. Bioplas films can be made breathable to keep your goods fresher for longer. A whole range of single use food service-ware products is available: cutlery, plates, cups, even boxes for transporting prepared food. Bioplas provides a unique opportunity for catering managers: it simplifies the clearing up process, leading to significant reductions in costs because disposable plates can be sent for composting together with organic waste. These can be used for horticultural applications. The collection of grass trimmings and direct planting to soil, which can help to protect young seedlings to establish.